For those who want to comment or vent their frustration about ArcGIS 10 there is a useful forum post on the forums.arcgis.com site. ArcGIS 10 looks really great but there also looks to be some bugs in the initial release….perhaps wait for the first service pack? Google have posted a video about how Google Earth Enterprise (GEE) is used at Islington Council in the UK. Nice slick video as you’d expect (except they’ve incorrectly named someone as a Principle rather than a Principal). Google Earth Enterprise isn’t something I’ve had a chance to play with. It would be interesting to see how much traditional “GIS” work GEE does (from demonstrations it would appear not much). I mean the heavy stuff; merging or splitting data, spatial queries, point-in-polygon analysis etc. I can see the benefits of the GEE as a display tool and how simple it is to use. But it sounds like it’s an add-on to the geospatial architecture rather then a 1 tool solves all. And how expensive is it? One thought…..if you’ve ivested in an ESRI GIS corporate solution (many companies and organisations have) why not use the ESRI free globe viewer, ArcGIS Explorer. If you have users which need to do ‘simple’ GIS this could be the way forward. You can configure tasks on the server and deploy to ArcGIS Explorer. And now for OpenStreetMap enthusiasts(!!!) (worthy of a seperate post) an OSM editor for ArcGIS Explorer has just been released. 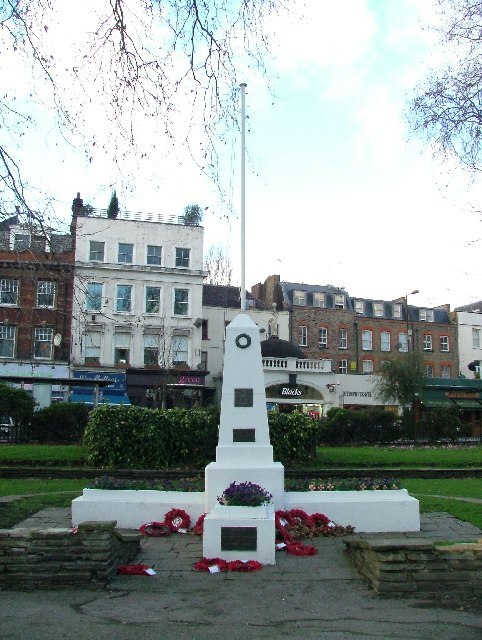 Thanks to Geograph.org.uk for the image of the War Memorial at Islington Green. GPS? = Global Poetry System!!!!! So you thought GPS stands for Global Positioning System? Well it also stands for Global Poetry System. See here for details. And there is a related internship for 6 months based at The Southbank Centre in London on offer here. It looks like you can tag your photo, video, docs etc. with poetic content (?!) and upload to the poetry map. Brilliant! Anyone got any other meanings for GPS? Garden Power Supply?! Green Petrol Station?! The Met Office in the UK has launched a new web map. It’s interesting! The image above seems to show that the whole of the south of the UK should “Be Prepared”. Does that mean take an umbrella? Overall it’s a pretty great site for weather enthusiasts with a lot of different information to look at – pressure, temperatue, UV, wind, and for hay fever sufferers a pollen forecast. If you log in you can even download data. One issue, with the amount of information they are trying to show, it is a little slow and clunky. Having said that I’ve only tried it on my wee laptop. Interesting to see how it works on a mobile phone…..I suspect it doesn’t. The estate agent, KFH, has launched a boundary based search. You can draw a boundary on the map and then receive property alerts based on that boundary. I haven’t seen anything like this in the mainstream (but perhaps I’ve not been looking too hard). It will be interesting to see if other estate agents follow suit with the same idea. These kind of spatial queries have been around for decades in GIS – has its time come for the mainstream? Will people be interested? Will it be a successfuly way to find a house? What if a house lies just outside the boundary (say a metre)? – possibly you’ll miss it. Bing Maps has added OpenStreetMap to its list of layers. See here for a post from Chris Pendleton (at MS)about it. It doesn’t sound that straight-forward to add the layer and not quite sure of the point to this. It might provide a more stable platform to view OSM but surely the road data from Bing Maps (Navteq) and Google Maps (TeleAtlas) is enough for the casual user. So will OSM break into the main stream? There is an interesting article by Steven Feldman in this month’s GIS Professional about OSM and the next steps (brief outline here). Halcrow have launched a blog site with blogs on Geospatial and Water Scarcity. Getty announces royalty free images….